Shooting a theme wedding is usually an incredible experience. Whilst I love shooting wedding where the couple are after a “Vogue” wedding photo-shoot result, shooting a traditional wedding is wonderful in different ways. I get to learn about how other cultures celebrate their weddings and it’s like I’ve got to visit another part of the world. It was very important for me to spend some time with the couple beforehand to learn about the wedding process in this case as there was certainly going to be no use of clichéd wedding poses! It was one of the most memorable weddings in my experience. Traditional costumes, new emotions and just great guys. 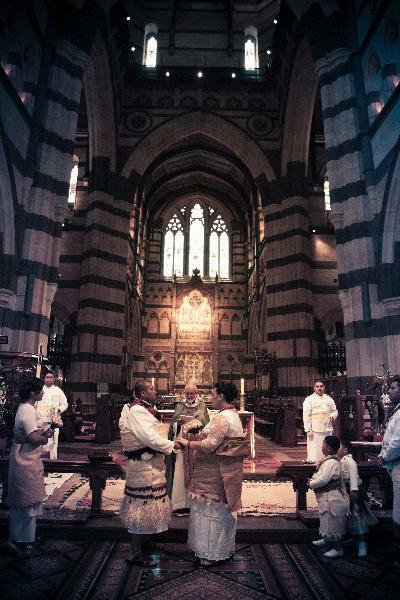 The ceremony took place in the heart of Melbourne at St Paul’s Cathedral. There was a church brass band and a chorus of 25 singers. I thought for a moment it was going to suddenly turn into a ceremony like the wedding in “Love Actually”. Lighting on the day was really challenging – it seemed every room had a mix of fluorescent, halogen and natural light which plays havoc with light meters. Add to that, the costumes themselves were high contrast – bright colours with lots of white as well. I ended up doing adding a bit more light to the photos during post processing to make the shots look a bit more summery, the result turning out really well I thought…. as did the happy couple! If you are going to have a traditionally costume wedding in Melbourne then give me a call – I’d be love to be involved.